I now know what it feels like to fall in love three times to three different men in three weeks. Am I the newest Bachelorette? Fortunately not, although I could definitely use a Chris Harrison in my life. No, I read Denise Hunter’s Summer Harbor Series where I was introduced to the three Callahan brothers. For a moment, I was recasting Legends of the Fall. Welcome to Summer Harbor, Maine! A beach town in summer and a Thomas Kincaid painting at Christmastime. The town is fun, full of activity and buzzing with drama just below everyone’s beautiful skin. This is especially true of the town’s women, Eden, Lucy, and Paige. Each heroine has a unique personality, the same tragic tendency to lose parents at a young age, and a habit of falling in love with Callahan brothers—totally understandable, ladies. Oh, the Callahan brothers. (Insert long sigh, swoon, warm flush on my face, fanning myself, long sigh again.) These men are handsome, successful, charming, (mostly) eligible, and from the description of it, really great kissers—just saying. They make great romantic leads and their stories are excellent. Overall, I loved this series. I’m now determined to read every one of Denise Hunter’s books. She combines romance and faith with likable, realistic characters. I had the chance to meet her and didn’t. It is probably for the best. You all saw how ridiculously Fangirl I was with Becky Wade. I would have frightened Denise out of the convention center, especially if I asked her what cologne the Callahan men wear that makes them smell spicy, because I’m buying it for my unsuspecting husband. I would rate each story a 5 out of 5 stars, but here is a breakdown of each story and its elements. Eden (picture Audrey Hepburn, with her class and grace) and her young son are fleeing from danger and end up on the front porch of the Callahan Christmas Tree Farm. Beau is the ultimate big brother type, always taking care of people and stepping up into a fatherly role after the loss of their own father. Parents in Summer Harbor have a very short lifespan, you’ll notice. 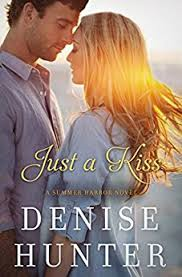 He takes in the stranded, desperate pair and the chemistry is immediate despite his unavailability since he is dating Paige. ***Don’t feel sorry for her, though. Captain America, I mean, Riley, is her shoulder-to-cry-on as you will see below. Eden is a damsel-in-distress, but she doesn’t come across as weak. She is a good mother, seeking to protect her son at all costs. Beau is a knight-in-shining-armor, but not just towards Eden. He doesn’t set out to play the role of hero; he just simply is. He protects his own at all costs. Remember when the Brady Bunch brought on Cousin Oliver and he ruined the whole show. Or maybe you remember Chrissy from Growing Pains. Thank goodness, Eden’s son, Micah, is NOT Cousin Oliver. His presence raises the stakes for Eden and gives her strength in her willingness to fight for his safety. He is sweet and not precocious in the slightest. Bonus: He always falls asleep at the perfect time to give Eden and Beau alone time. Lucy (picture Reese Witherspoon) returns to Summer Harbor in a wedding dress with amnesia, seven months after leaving her fiancé, Zack, a week before their wedding. I KNOW, RIGHT?! Lucy is like a labrador retriever. She is adorable but maddening. You want to punish her for destroying your couch, but she is just too sweet to punish. Then, as her backstory filters into the story, your heart breaks for her and it all makes sense. Zack is a dream. He is hardened from hurt and proud in that Mr. Darcy way, but still helpful to the woman who wrecked him. The only thing I didn’t like about this book was the minimal presence of Riley and Paige, but it made sense with the storyline. See below. I didn’t realize this was the third book in the series when I started it. I read it first, so it was my favorite. Riley, the youngest, funniest, coolest, and spunkiest of the brothers, is Captain America in my mind. He is a marine, he is strong and brave, and rides a motorcycle named Lola. He returns from the war injured, troubled, and determined not to remain in love with his best friend, Paige (who would be played by Margot Robbie in a movie, I decided). I love Paige. She is my favorite of the Summer Harbor gals, and not just because she has no qualms going behind a pine tree to use the bathroom. She is caring, self-sacrificing, and runs a pet shelter, for goodness sakes! Paige is that gorgeous friend in high school who has no clue that every guy is crazy over her and you are like, “that guy is in love with you” and she’s all, “no, we are just friends” and then you want to pour your Friendly’s Fribble on her to wake her up—true story. Girl doesn’t see that Captain America has been pining for her FOR YEARS! It is frustrating, but you’ll get over it pretty quick. For a more specific breakdown of the elements I care most about, read on. 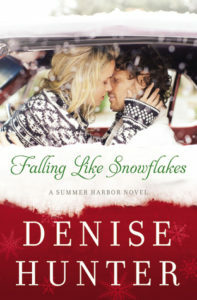 Snowflakes: I suddenly wanted to hang mistletoe over my kitchen sink…in October. Bride: I may have read that dark hallway scene more than once. Kiss: The truck scene. I’d say more but then my laptop’s fan might have to kick on. 2 — SPOILER ALERT: Physical and sexual violence is remembered but care is taken so it shouldn’t be too triggering. PTSD is also mentioned, and a war scene is remembered. I cried in each one. Ms. Hunter describes the characters pain so realistically that you feel such empathy for them. This high score isn’t a bad thing. Every time I disagreed with the character I just wanted to keep reading more. At one point, I commented on Denise Hunter’s facebook page that she needed to right a certain wrong quickly. She laughed at me and told me to read on. I’m glad I did! 4 — The books differed in this area but they all had romantic suspense (will they? won’t they?). Snowflakes had a good deal of edge-of-your-seat, squeeze-your-husband’s-hand action. Bride had more mystery in it. Overall I highly recommend this series to readers of Christian/Inspirational Romance! 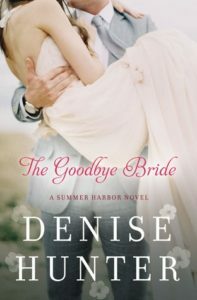 Preorder Denise Hunter’s Upcoming Release, Blue Ridge Sunrise here. You can also visit her website here or check out her facebook page here. Sign up for my newsletter below to get more fun and honest reviews of Christian novels! Love how you broke down the review into elements! I appreciate that.